... 1912, hours after colliding with an iceberg in the North Atlantic, the brand-new luxury cruise ship Titanic sank in the waters off Newfoundland. 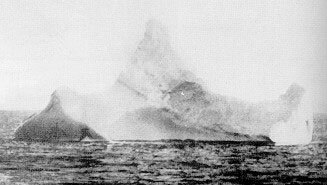 (credit for photo of iceberg believed involved) Soon after the collision the Titanic crew "were putting the women off in boats" in order that they might be rescued by other ships. In the end, 1,517 of the 2,223 persons aboard perished.